Compliance: Government places multiple and changing obligations on local councils to publish information disclosing governance compliance, financial records, council objectivs and much more. Your website needs to be flexible enough to easily meet those obligations. Online publishing: There is increasingly a presumption that local government information will be published online where this is possible. Also the National Association of Local Councils Local Council Awards Scheme requires council information to be published online. Change is difficult: There is always pressure on time and costs and it is always easier to continue the established way of doing things such as via newsletters, noticeboards, letters and providing access to physical records (e.g. such as draft accounts). You need to be sure that a new website will not impose an unnecessary burden on your clerk and councillors from the development of the new website or the maintainance of the new website. Councils are busy and multi-functional organisations: To reflect ongoing council activities, council websites need to be constantly updated with new plans, reports, documents and contextual information as it happens. Unless the website is structured to meet the current and ongoing requirements of the council you may not have suitable places to add new information and unless the website is designed for these updates to be easy they can unnecessarily increase the Clerk’s workload..
Local Government Clerks Are Specialists: Clerks need to focus on Continuous Professional Development so as to support the council rather than learning website skills. E.g. training is required to invoke new powers such as the General Power of Competence and so the clerk needs to spend less time on the website not more. Your website needs to be easy to administer in a way that fits in with your way of working. Notification / agendas for meetings and minutes for those meetings. Notices regarding staff and councillor vacancies, elections, the availability of draft accounts for scrutiny and other notices. And potentially a lot more. a responsive i.e. it looks good on phones and tablets as well as on a laptop or desktop. and above all easy to update with notices, news and documents. easy to handover to a new clerk or administrator. Encouraging residents to visit your website: Additionally you may wish to publish useful information for residents to keep them visiting the website. Educational information about the workings of local government may help promote civil engagement. Promoting all the activities that are undertaken by the council and involving residents in choosing the objectives and approaches to developing the built environment, heritage, infrastructure, services and the community itself helps you prioritise activities and focus on developments and services that are of particular local interest. You may already publish information via social media such as facebook and twitter. These can have links back to your new website. We want to understand the way that your council works and the expectations that you and your residents have for a new website. Your website can be a powerful tool for communicating to residents the activities of the council and demonstrating your role in promoting and enabling greater social, financial and environmental wellbeing for your parish. 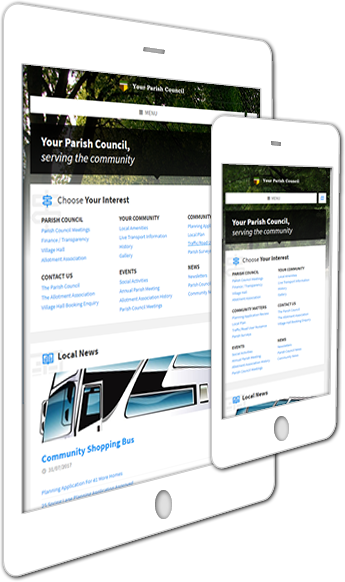 The parish council website requirements are partly driven by the regulatory requirements to publish information and partly by the scope of activities undertaken by the council. And for councils that are aiming for certification under the National Association of Local Councils’ (NALC) Local Council Awards Scheme the website helps demonstrate your compliance and so it is partly driven by the publishing requirements of the award.. Smaller Authority design approach – aimed at providing the ease of use, resilence and professional image for the website while focussing on compliance with the Transparency Code for Smaller Authorities. Open Council design approach – aimed at open publication and reporting of all the council’s activities based on the Model Publication Scheme for the Freedom of Information Act 2000 and providing the ease of use, resilence and professional image for the website. Quality Award design approach – for a website to complement the requirements of the NALC Local Council Awards scheme plus providing the ease of use, resilence and professional image for the website. There are 3 levels of award: the Foundation Award, the Quality Award and the Quality Gold Award. 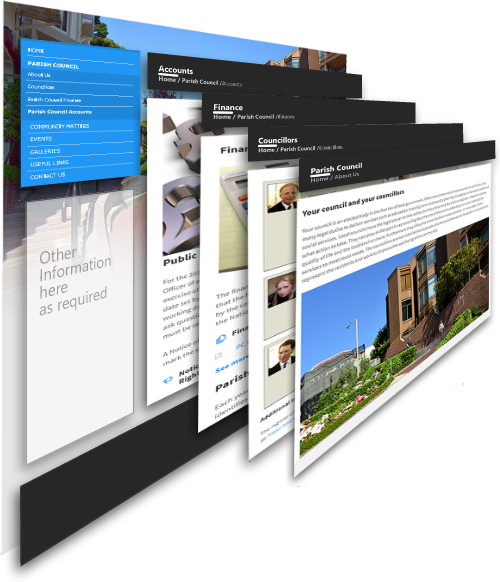 Our easy to administer websites are designed around the legislative requirements for town and parish councils and customised for your specific requirements with information about your council and your community and loaded with your existing documents. We will contact you by phone and email and if appropriate and convenient we will meet with you to analyse your requirements and to discuss the website style and structure. We can start with one of a number of different approaches (described by Our Products pages) for the design of your website which depend on the size of your council, the scope of your council activities and whether you are considering the NALC Local Council Award scheme. We will prepare a quotation based on your requirements for consideration at your next council meeting. If you award us a contract we will have further discussions about the structure, content, style and images for your website and will then prepare a draft website for you to review. We will make changes to the draft website as required and will then give you time to test the website and learn how to update it with new information and articles. When you agree that the website is complete we can make the website public and hand it over to you. Web browsing with a smart phone or tablet computer overtook the volume of web browsing by desktop and laptop computers in November 2016 according to Web analytics firm StatCounter. For website owners this means that it is essential that website are designed to be responsive i.e. to reformat when used with different devices so that the layout is appropriate and readable. We would love the opportunity to discuss your requirements with a view to preparing a quotation for you. We don’t have one size fits all products and we need to first understand your requirements in order to give you a competitive quote.